All vineyards need a dog and Haythornthwaite Wines is no exception! Meet Russell - the vineyard dog who chases every car and bicycle tyre he can find. 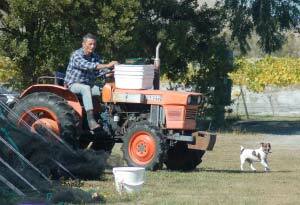 Russell is a Jack Russell belonging to Glenn Smith our Vineyard Manager. Russell has proved to be one of the best rabbiter’s we have, and regularly chases rabbits and birds in the nets.